A Leighton Buzzard boy who who lost a hand and both legs to a deadly meningitis infection was delighted to be chosen to switch on this year’s Christmas lights by the people of Leighton Buzzard. As revealed earlier this month, Kye Vincent, 10, is one of the community champions chosen to flick the switch on Friday, November 30, at 7pm. 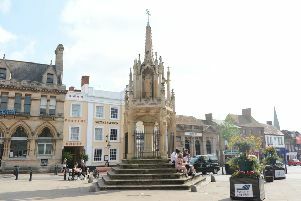 After receiving many nominations from readers, Kye was subsequently picked for the festive task by a judging panel made up of LBO, LB First and Leighton-Linslade Town Council representatives. Much-loved Waitrose car park attendant Keith McAngus was also selected for the lights switch on. Kye’s mum Cheryl told the LBO the youngster was stunned when he was told he had been picked. She said: “He didn’t believe me at first, it wasn’t until I showed him the story in the paper that it sunk in! “He got very excited because it’s something he’s gone to every year. We always go into town to watch the lights switch on and fireworks, and so this is going to be special. Family, friends and members of the community fundraised throughout the summer in order to finance a £11,000 bionic hand for Kye. He has already been for a fitting with company Open Bionics and is expected to receive the bionic hand on December 20. Mum Cheryl added: “He has used a trial hand [at the fitting] and he did very well. “He picked up a crayon and passed it to me, I was over the moon and could feel myself welling up.